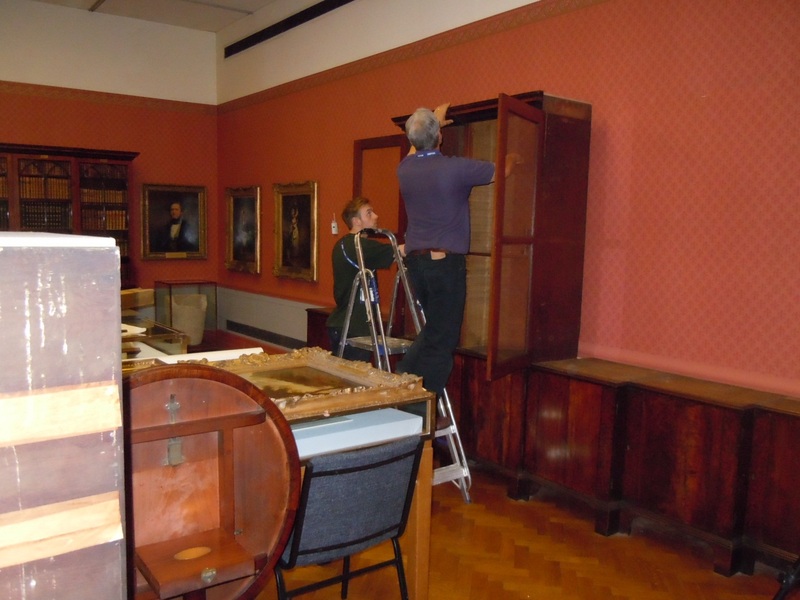 Following on from my last post, once we’d finally managed to clear all 300+ books out of the largest bookcase, Allan and Chris from Tankerdale set about dismantling it into its 16 sections; eight glazed top units and eight low cabinets with veneered doors. When they got to the middle sections, we found that they were shallower in depth than the other base units, and that the incremental depths of the eight sections were regular until the centre two units. There were also what looked like veneered sides to some of the vertical abutting bits of the units, which (in its current configuration), never see the light of day. What do these discrepancies mean? Thanks to Dr Bowett, we already knew that the configuration of this bookcase had been altered, and that what were once two separate bookcases had become one. These new clues may help us to pin down the original configuration of Charles Rogers’ bookcases and may yet suggest further alternatives for the early life of this 256 year-old piece. Plymouth Museums Galleries Archives WordPress.com.